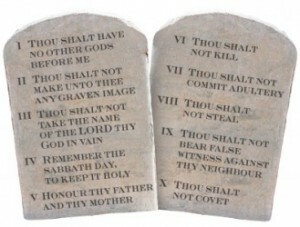 SANDPOINT, Idaho — Approximately 300 to 500 Idaho residents recently rallied to show their support for a Ten Commandments monument displayed in a public park, and to oppose atheist efforts to have the monument removed. Residents of Sandpoint, Idaho state that they are outraged that city officials are being swayed by an atheist activist organization to remove a Ten Commandments monument from Fannin Park. The hundreds that attended a rally last Thursday in support of the display held signs and participated in a petition calling for officials to allow the monument to remain. The Madison, Wisconsin-based Freedom from Religion Foundation (FFRF) had mailed a letter in November to Sandpoint officials after allegedly receiving three to four complaints from citizens and non-residents about the presence of the Ten Commandments monument. The organization contended that the display cannot lawfully remain on public property. In a status recently posted to the Sandpoint Police Department’s Facebook page, it was revealed that Mayor Carrie Logan had asked that alternate locations for the monument be discussed in order to eliminate city liability in the issue. But residents remained disturbed about the matter and scheduled a rally last week to speak out. As a city council meeting was also held last night to discuss the issue, residents packed the hearing to express their views, with the vast majority speaking in favor of the monument. While no decision has yet been reached in the matter, the Texas-based Liberty Institute has offered to assist the city with legal representation pro bono should FFRF file suit.